The society museum and research center is located in the former law office (building on the right) of attorney John Wilson Stephenson (1850-1921) next to the courthouse in Warm Springs, Virginia. It was moved from the site of the original courthouse (now the Warm Springs Inn) in the late 1890's. The "Parents' Room" features an antique string spool four poster bed surrounded by all kinds of interesting personal effects including a vintage shoe display as well as period dresses. The two dress displays here are made more poignant by the actual photos nearby of the women wearing them prior to 1900. The gothic steeple clock near the corner dates from 1855. The "Kitchen Nook" features an 1850 walnut hutch filled with porcelain and ceramic treasures accented with sterling silver flatware and other period artifacts. The beautiful green gown dates to 1857. The tea set on the second shelf with an "W" over "M" monogram is an 1893 copy of the Martha Washington service produced for the 1893 Chicago World's Fair. The gold edged white breakfast service and bone handled flatware belonged to the McClintic family who owned "Hickory Lodge," a Jackson River estate flooded to create Lake Moomaw. The front room nearest the front door has been transformed to tell the story of the history of Bath County from its very beginnings to the present day. Large, well lit display cases in the center of the room provide exhibit space for treasured memorabilia and artifacts that form the story of Bath County. "The Wars" exhibit contains memorabilia and artifacts primarily from the Civil War period, including excavated items from nearby Virginia battlefields. There are also original photos of Bath County servicemen. A highlight of our renovated museum is the "Vignette Wing" that features three period rooms decorated to highlight our fabulous collection of 19th Century furniture, memorabilia and vintage clothing. The "Children's Room" features an early Bath County 1830 cradle along with photos and clothing from the 1800's. The dresser with mirror top at left is from the Warm Springs Hotel which fell to the wrecking ball in the 1940's. The historic handmade "Bicentennial Quilt" wall hanging was sewn by local women to commemorate popular Bath County destinations and landmarks. The Terrill sofa (circa 1840, left wall) came from the home of Colonel William Henry Terrill, Bath's Commonwealth attorney for three decades. Margaret Lynn Lewis, one of the original Bath County settlers, is the subject of the painting in the center. To the right is the Warwick family desk and cabinet (circa mid 1800's) filled with Bath County family memorabilia. Another interesting corner in the "Vignette Room" is the "Historic Homes" display. This photographic exhibit shows many of Bath County's grand historic homes as well as early log cabins, many of which no longer exist. The display cabinet below is filled with vintage personal effects of long-passed Bath County residents. Other exhibits of interest include a tribute to famed author and long time Warm Springs resident Mary Johnston (1870-1936) on the right facing wall. Below this sits an antique map chest. The perimeter walls in the front room highlight various episodes in the story line of Bath history. This first introductory display just inside the front door tells the history of the springs, the original feature that drew prehistoric man to this area. Continuing into the back room of the exhibit area, there is an extensive display of 19th Century agricultural memorabilia from early Bath farms. The implements are quite unusual. We have a fabulous research library too! The research center offers plenty of space and accessibility to our archive of Bath County family histories, census records, newspapers, original photographs, family scrapbooks, court records, marriage records, birth and death records, ephemera and many other reference sources covering local and state history. 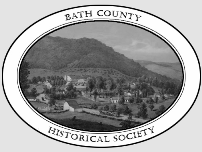 particular to Bath County History available for sale to all visitors.